Tim Napier (L) and Melvin Bodenheimer at a parade held in Buddy D's honor on January 31, 2010 in New Orleans. Thousands of Saints fans wearing dresses paraded from the Louisiana Superdome to the French Quarter to honor a promise made by the late sportscaster and Saints super-fan Buddy Diliberto aka "Buddy D". In 1993 Buddy D, who passed away in 2005, remarked on air that if the Saints were to make it to the Super Bowl, he would wear a dress and dance down the streets. The comment was repeated at various times and never forgotten by his listeners. 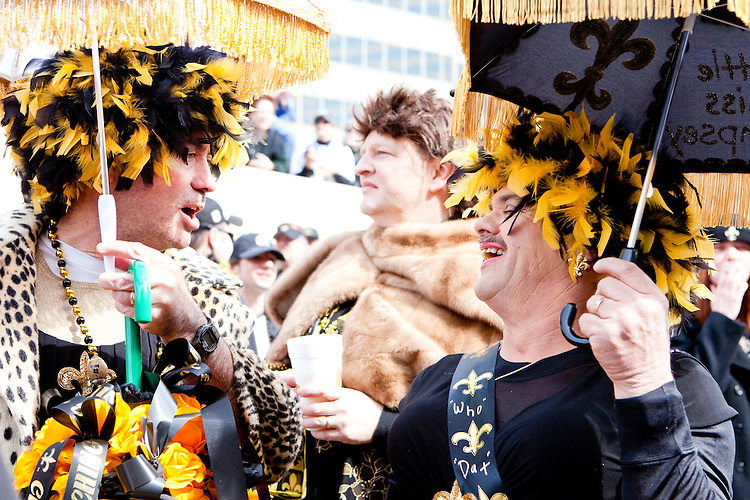 Led by former New Orleans Saints quarterback Bobby Hebert, who has taken Buddy D's place on WWL radio, thousands made good on his promise for him, dancing, drinking, and cavorting their way down the street, alternately yelling out "Who Dat!" and "Buddy D!" in front of an onlooking crowd an estimated 85,000 people strong. The hard luck NFL team the New Orleans Saints has reached its first Super Bowl in team history, after 43 years largely filled with losing seasons and futility. It is difficult to travel anywhere in the area without some reminder of this fact, as the team and city are intertwined perhaps like no other sports franchise in this country.